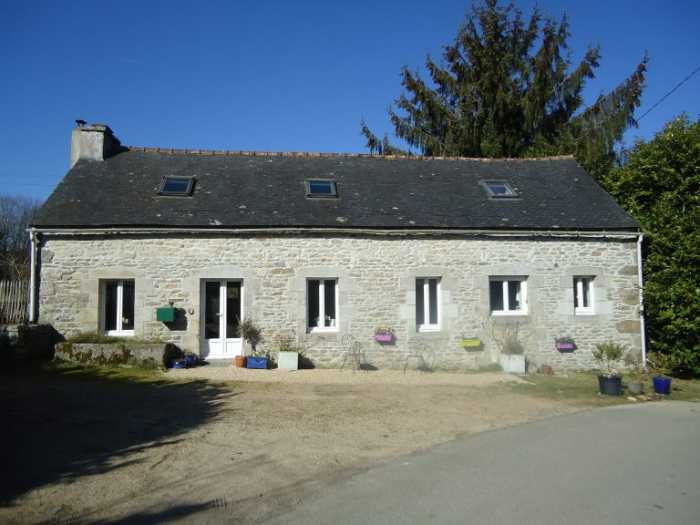 Properties for sale in Brittany, France - AHIB-3-M2229-2914988 Huelgoat 29690 Pretty longere on the outskirts of Huelgoat with 1 hectare of land, ideal for horses! Also, a lovely kitchen/dining room, again (this is an extra large room), a lot of storage units in the kitchen, very functional and the dining area is large enough for a family. A door gives access to a pleasant conservatory facing the beautiful garden/land, it is cosy with a wood burner, there is also a brand new bathroom with shower and WC. On the first floor there are two superb double bedrooms with velux windows and a bathroom with bathtub and WC. Nothing to do, everything is conformed and upgraded. Double glazed windows throughout, good electricity, and a conformed septic tank. In the front of the house is a plot of land which is divided into different areas, one for the vegetable patch and one for the orchard, and there's a large field that is all fenced for the animals, you will also find a stable and wooden barn. It is a quiet hamlet, not overlooked. It has a lot of advantages to offer!